Do you like the dark? Do you like the way it moves? Do you come alive when neon kills the sun? 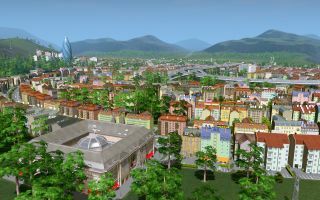 If you answered yes to at least two of those questions, then first, rock on, and second, you'll be happy to hear that the first expansion to the hit Cities: Skylines has been revealed as After Dark, featuring a day/night cycle that Paradox Interactive says will have a big impact on how cities are managed. "Day and night changes in the city and affects citizen schedules," the publisher explained. "Traffic is visibly slower at night and some zoned areas do not work with full efficiency, further easing the traffic. Service vehicles move around as usual." Other changes in the expansion are Leisure Specialization for commercial areas, which will make them more active at night, and Beach Specialization, which will enable "beach activities" in commercial areas such as beach bars and restaurants along the shoreline. City services are also being expanded: Criminals will be transported from police buildings to prison, taxis will hit the streets, and an international airport will allow for much greater volumes of traffic than the current model. Released in March, Cities: Skylines handily out-citied SimCity and became a surprise hit, setting a Paradox sales record and quickly racking up more than one million units sold. In July, developer Colossal Order said it intended to support the game "as long as we possibly and technically can." A release date for After Dark hasn't been announced, but Paradox says it's "coming soon."